I erased and retyped the subject line of this email and the first paragraph at least five times. Who wants to hear about death, I thought to myself, it’s the holiday season and you should be writing about something cheery and fun. But there’s something valuable to be learned in a conversation about death. Death is a game-changer. When we’re brave enough to face our own mortality, or when we’re thrown into the grief process after the loss of a loved one (or a pet, in our case), we’re initiated into a special club. In this club, we’re awakened to what really matters because so much of life seems pointless without the person or pet we’ve lost. In my next book, I write about how I rejoined this club when I turned fifty and began to face my own mortality. This excerpt comes a bit later in the book, when I’m beginning to discover what death has to teach us about life. Today I can feel a tiny hint of spring stirring in my body. Outside it’s sunny and forty-five degrees. I went for a long walk in the neighborhood early this morning, and then again later at the beach. As I walked along the shore, lulled by the steady roar of crashing waves, I closed my eyes and imagined gliding on a boogie board in the heat of the summer, the way I used to when life was simpler, and I was in the habit of having fun for its own sake. It’s good therapy. These days, as I consider the new, emerging priorities in my life, I continue to be guided by thoughts about death. That sounds dark, I know, but in this case it’s not. I’m learning to befriend the part of me that feels the need to keep my mortality on the front burner. When I find myself suffering for too long in order to write a gracious email saying no to a request, or feeling frustrated while lugging last-minute packages to the post office before they close, I ask myself, Am I doing what I really want to do in this moment? Is this how I want to spend my energy? Can someone else do this so I have more time and space for what matters to me? I’m trying to get a fresh perspective, to step back from the routines that define my day in order to see how satisfied I am with the choices I’m making. Our lives are shaped by the actions we take every single day, from the mundane errand or the therapy session, to the project we take on at work or the conversations we have with our friends, our partner, or our pets. I want to stay awake. I want to stand witness to the choices I make that sculpt this one precious life. I want to stay connected to who I am today, not reflexively serve the person I’ve been in the past. At times like this, thoughts of impermanence are a gift if we’re brave enough to entertain them. For most of us, the thought of death is a frequent guest, one who continues to visit despite the fact that we do our best to ignore her. I’m making friends with this visitor because I know she has something vital to teach me. Stand back, she says. Observe your life. 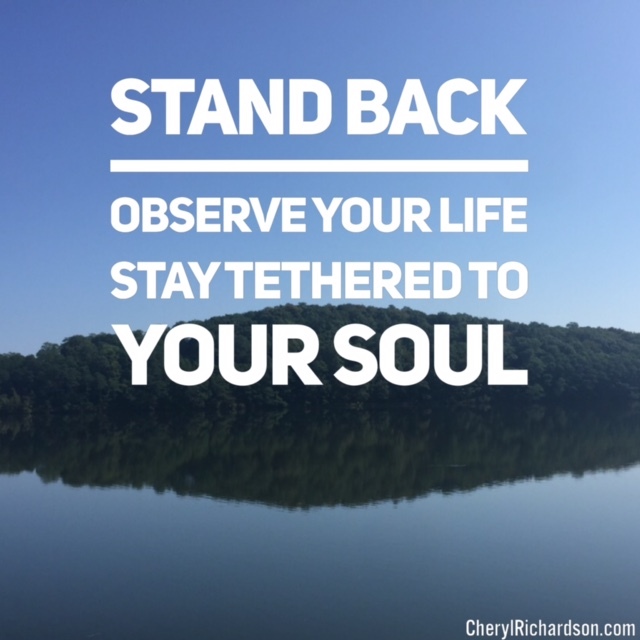 Stay tethered to your soul. I want my life to be well lived, to be a true expression of my most authentic self. And I must stay awake to do so. You can preorder Waking Up in Winter, here. This book (which will arrive in time for Christmas) makes a great gift for the men and women in your life who want to honor more of what truly matters in their lives. P.S. – There will be no scheduled Facebook Live Session this week while I’m in London, but I will be sharing a few of my favorite holiday gift ideas via Facebook Live tomorrow. Be sure to check my Facebook Page later in the day. Also, you can check out replays of Facebook Live sessions on my on my YouTube channel at CherylRichardsonTV here.